Our latest eBook release from Distributed Proofreaders is The Curse of Pocahontas, a 19th century story paper melodrama published by pseudonymous author Wenona Gilman. 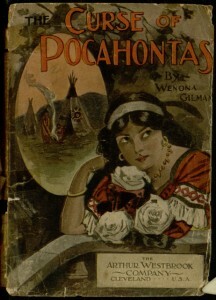 The story’s heroine is a descendant of Pocahontas who also happens to be half-Mexican, and the titular curse allegedly dooms her chances at a happy love affair. In typical story paper fashion, her path to eventual happiness is blocked by murder and conspiracy, but the book is surprisingly kind to her in spite of telling a story essentially rooted in the typical racism and sexism of its era. Social commentary aside, the book’s most interesting characteristic may be its willingness to directly reference contemporary popular fiction. Early in the book, two characters have a fairly detailed discussion about Ships that Pass in the Night, a novel by Beatrice Harraden. Later, Sir Arthur Conan Doyle‘s The Adventures of Sherlock Holmes plays a role in the story. Similar to the references to scientific and medical advances used in some of Mrs. Alex. McVeigh Miller‘s works, this helps to demonstrate that story paper authors made an effort to incorporate subjects of immediate interest to their readers into their tales. To read the whole story for yourself, you can visit Project Gutenberg, where the entire book can be viewed online or downloaded in several eBook formats.